Ever since Legalese opened its doors over two years ago, a large chunk of our client base has been musicians. You’re a big part of the reason we got into this business. The music industry is notoriously brutal, especially to young musos, independent artists and established acts that are doing it DIY. Which is why we’re trying something new. As creative lawyers, our experience has shown that with current online tools and digital solutions, independent music publishing is easy, accessible and affordable, and artists don’t always need a big company behind them or a fancy deal under their belt to be successful in the industry. What artists sometimes struggle with is the administrative side of things – something lawyers happen to be very good at. With this in mind, we are excited to announce that we’re offering a unique and tailored service to independent artists who have a back catalogue or are in the process of releasing new music. We take care of all the royalty registration requirements and publishing administration that goes on behind the scenes of the business of music. We put the building blocks in place for you to submit to radio, sell your music and collect your money when it’s played or performed in public. The most important bit? You. You make your own decisions, you control your works and you’re not under any obligations to deliver. We just help you to manage the admin so you get on with making that music. 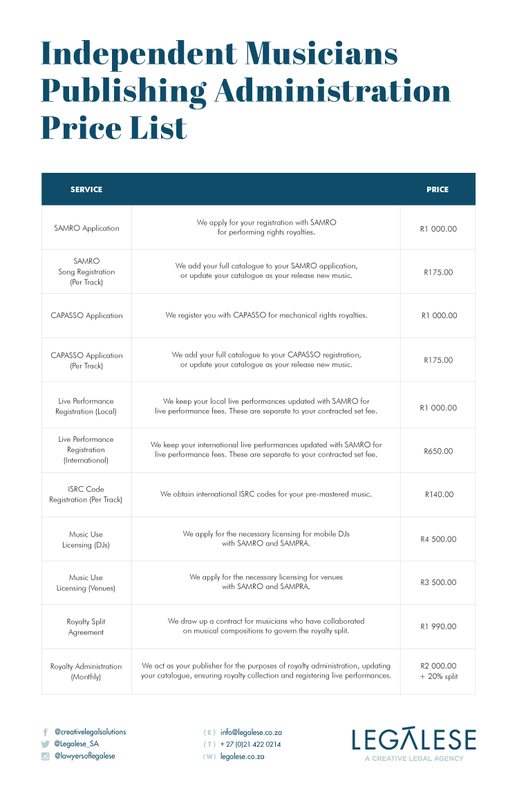 Check out our price list below, and send us a mail on publishing@legalese.co.za for more information.